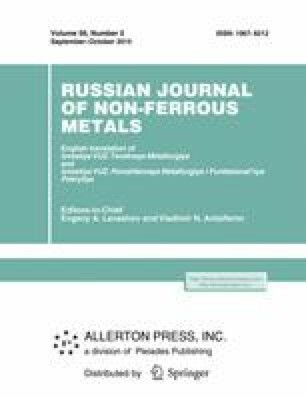 Structure and phase formation in the course of fabricating composite ion–plasma vacuum-arc nanocrystalline TiN–Ni coatings are investigated in a broad range of nickel concentrations (from 0 to 26 at %). It is established that the introduction of Ni into the coating composition refines the nitride phase crystallites. The arithmetic mean size of TiN grains decreases from 100–120 to 15–18 nm upon varying the Ni concentration from 0 to 12 at % and normal particle-size distribution. The further increase in the Ni content is accompanied by the transition to the polymodal particle distribution with an increase in their arithmetic mean diameter to 27 nm for the third mode. Nickel in coatings at a concentration of 12–13 at % Ni is in the X-ray amorphous state. As the concentration increases above 13 at %, the TiNi intermetallic compound is formed in the composition of coatings. This phenomenon in turn causes the appearance of porosity in the structure of the deposited layer. The blocking role of nickel simultaneously weakens with the formation of the intermetallic compound, which manifests itself in the growth of separate TiN grains to 30–35 nm. The TiN–Ni coatings are characterized by the thermal stability of the structure and composition upon heating to 800°C. Original Russian Text © I.V. Blinkov, A.O. Volkhonskii, D.S. Belov, N.Yu. Tabachkova, M.I. Voronova, V.A. Andreev, M.N. Sorokin, 2014, published in Izvestiya VUZ. Poroshkovaya Metallurgiya i Funktsional’nye Pokrytiya, 2014, No. 2, pp. 43–50.